Quick update on FW Thorpe (TFW). Summary: Yet again this lighting specialist has delivered a very satisfactory annual performance, with revenue and profit attaining fresh all-time highs and the dividend lifted for the fifteenth consecutive year. Although the group’s largest division appears to be performing very well, other subsidiaries did not enjoy the very best of second halves. Management comments about 2018 seemed quite cautious, too. The accounts remain in pristine condition, but I am mindful of the shares trading at a rich multiple. I continue to hold. TFW’s impressive interim statement — which showed growth of 20%-plus and carried an “optimistic” outlook from the usually conservative board — had already suggested these preliminary figures would be very respectable. 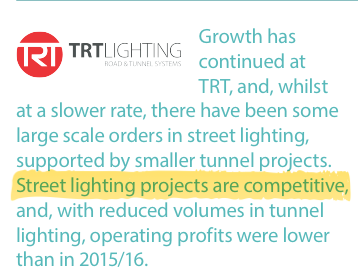 During 2017, revenue gained 19% and operating profit (before research tax credits) climbed 14% as all companies within the group apparently showed “improved trading performances”. The progress meant the business has now reported record results for the last four years and has doubled in size since 2007. One point missing from the management commentary concerned currency fluctuations. There had been no word on the effect of the weaker GBP on TFW’s performance within March’s first-half update, and there was no word again within this statement. Some 32% of revenue during 2017 was produced overseas and I am sure the weaker GBP helped to bolster these figures. Given TFW’s large overseas income, I can’t understand why the effect of foreign-exchange movements has not been disclosed. I should add that these results were the first to be signed off by TFW’s newly appointed executive chairman. Veteran TFW leader Andrew Thorpe stepped down to become a part-time executive (and part-time angler) during July, and made way for long-time joint chief exec, Mike Allcock, to take on the executive chairman role. As handovers go, the move did not appear too worrying. Indeed, Mr Thorpe still owns a 24%/£93m shareholding and therefore ought to have more than a passing interest in how the group performs from here. But I feel these results make clear that he wanted to effectively retire from TFW when the business was riding high. H2 revenue and profit gained 14% and 9% respectively, versus 24% and 18% for H1. The subsidiary’s revenue and profit soared about 25% during H2, versus around 16% for H1. Thorlux’s 2017 performance was certainly its best for several years — the subsidiary had been previously growing at a very low single-digit rate. “Thorlux is our largest company, producing the most extensive range of lighting products for the widest market sectors. It is a product-led business offering solutions with key features and benefits. Thorlux never targets being the lowest capital cost supplier, instead it targets the lowest cost to the end user through the lifetime of a project after energy and maintenance costs are taken into consideration. Following its successful transition through the LED lighting revolution, and in its subsequent strengthened position, Thorlux has now entered the wireless lighting controls arena, having fully launched its SmartScan system. 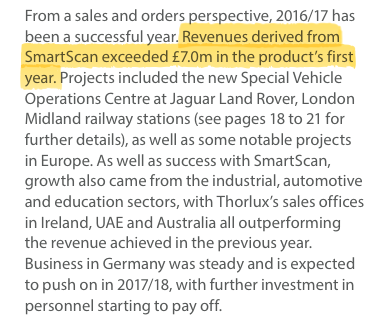 Developed in-house and on sale since September 2016, SmartScan delivered sales that grew rapidly and became a significant part of the year’s success. SmartScan’s features have found favour with existing and new clients. I’m hopeful the division’s new wireless systems can enjoy further success. The upbeat progress at Thorlux masked some less inspiring second-half performances elsewhere in the group. “One off projects” were said to have helped Lightronics during H1, so I’m guessing a lack of such work hindered the H2 effort. Still, I can’t really complain about the division’s overall achievements for 2017. 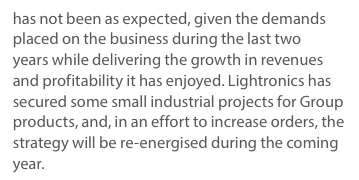 Indeed, the ‘downside’ to Lightronics’ progress is that the sum TFW owes to the division’s former owners as an ‘earn-out’ — which is based on the operation’s profitability — has increased once again and now stands at £5.8m. An improved first half was followed by a second half similar to that of 2016, and profit ended the year flat on last year. TFW’s accounts continue to be a pleasure to read. For a start, the balance sheet remains in pristine condition. TFW’s cash — combined with its eclectic mix of investment property, quoted shares and loan notes — finished the year more than £7m higher at a sizeable £52m. Furthermore, the balance sheet continues to carry no borrowings and I am glad TFW’s final-salary pension scheme still shows a surplus. 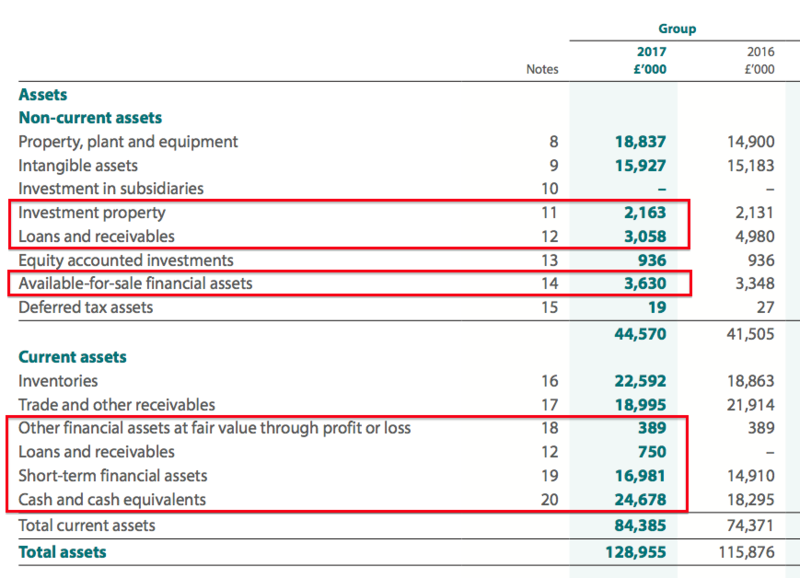 With the aforementioned £5.8m earn-out for Lightronics being the only sizeable liability, I calculate net cash and investments to be approximately £46m or 40p per share. Although capital expenditure once again exceeded the deprecation charged against earnings, past differences have generally been due to property purchases. Management comments suggested that was again the case for this year. The cash production allowed the full-year ordinary dividend to be raised 21% to 4.9p per share. My records show the annual payout has now been lifted for 15 consecutive years, during which time four special dividends have also been declared. 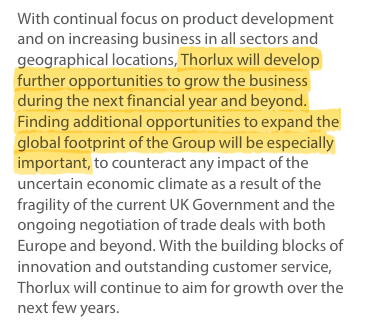 The 17% group margin hides the fact the Thorlux division converts a superb 22% of revenue into profit. Meanwhile, my return on average equity ratio — which ignores the group’s cash and investment hoard and adds back the Lightronics’ earn-out — remains very respectable. Using the 2017 operating profit of £18m and applying tax at the 21% seen in this annual statement, earnings come to about £14.4m or 12.4p per share. 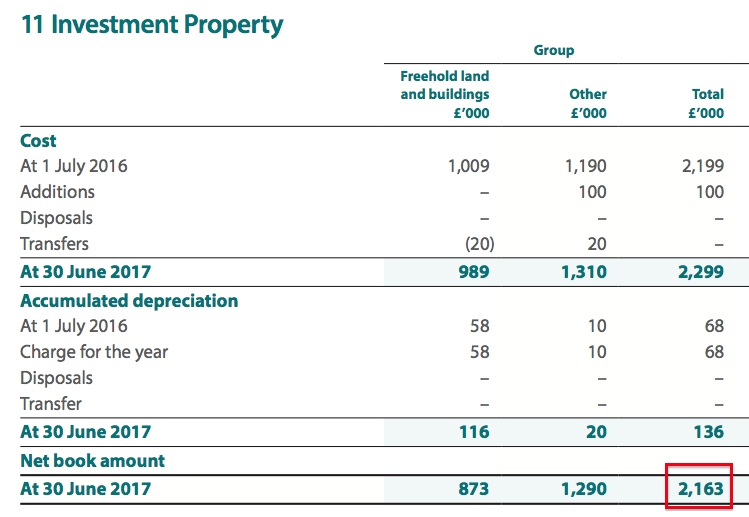 Then adjusting the present £393m market cap (at 340p) for the group’s net cash, investments and the Lightronics earn-out, I arrive at an enterprise value (EV) of £348m or 300p per share. Dividing that 300p per share EV figure by my 12.4p earnings guess gives me a trailing P/E of 24. Given the impressive headline growth rates for the full year, I suppose that upbeat multiple is to be expected in the current stock market, where rich valuations continue to be applied to many attractive growth stories. However, there are some causes for concern with TFW. Certainly the second-half progress at Lightronics was not as spectacular as the first, while profit at the Other UK operations appears to have stalled. …may be a hint that the growth rate could moderate — or even reverse — during 2018. I also wonder about the decision by long-time boss Andrew Thorpe to step down and become a part-time executive in July. I just hope his bowing out is not due to him foreseeing a slowdown on the horizon. Anyway, perhaps the leadership change can one day prompt a shift to TFW’s perennially tight dividend policy. Although the full-year payout was upped 21%, it remains covered a sizeable 2.6 times by earnings and 8 times covered by the group’s net cash and investments. The yield at 340p is a paltry 1.4%. Disclosure: Maynard owns shares in FW Thorpe. This entry was posted in FW Thorpe, My Shares and tagged FW Thorpe, TFW on September 22, 2017 by Maynard Paton. “Last year we achieved record results and my September statement referred to the challenges in maintaining these for the current financial year. We presently expect the interim results to be in line with the same period last year. The caution is not great for a stock rated at 24x earnings. Still, it has not really paid to be a seller of this business long term. F W Thorpe is pleased to announce the acquisition of 100% of the share capital of Famostar B.V. (“Famostar”) in the Netherlands, a specialist in emergency lighting for a range of different sectors. The acquisition is expected to enhance earnings per share in the first full financial year of ownership (to 30 June 2019), as well as complementing the Company’s existing technologies, providing potential growth opportunities and synergies. It is expected to make a minor contribution to Group profits in the year ending 30 June 2018. F W Thorpe has paid an initial consideration of €7.6m (circa £6.8m), with up to an additional €0.5m (circa £0.4m) payable subject to performance conditions relating to the EBITDA for 2017 and 2018. The Famostar investment will be acquired via Lightronics Participaties B.V., our holding company in the Netherlands and be subject to similar share appreciation conditions established when F W Thorpe acquired Lightronics in 2015. The initial consideration has been funded from the Company’s existing cash reserves and this is the intention for any additional consideration. The senior management team will remain in the business and report directly to the board of Lightronics B.V.
Famostar specialises in the development, manufacture and supply of emergency lighting products. Revenues are derived from the Netherlands, where it is considered one of the foremost brands in the market. Famostar was originally established in 1947, is based in Velp and currently employs 31 people. During its last financial year ended 31st December 2016, Famostar achieved revenues of €6.8m and adjusted profit before tax of €0.9m. For the year ending 31st December 2017 forecast revenues are €7.8m, with an adjusted profit before tax of €1.2m. Net assets as at 31st December 2016 were €2.9m. The addition of Famostar will further develop the Lightronics presence in the Netherlands and expand its emergency lighting product portfolio. “I would like to welcome Famostar to the F W Thorpe group. We are looking to build upon our successful acquisition of Lightronics by growing our presence and our product portfolio in the Netherlands. 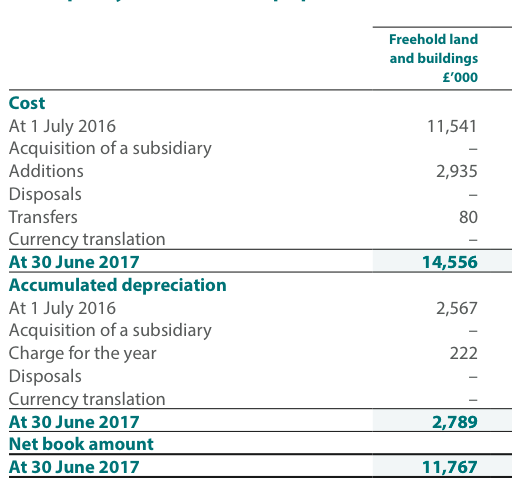 Paying €7.6m plus up to €0.5m for pre-tax profit of €1.2m equates to a 6.3x pre-tax multiple — although my sums do not include the additional “share appreciation conditions” that will incur an extra cost. Famostar looks a decent business. Established for 70 years, enjoys a respectable 15% margin and employs 31 workers each producing average revenue at a sizeable c€250k. Oh dear. 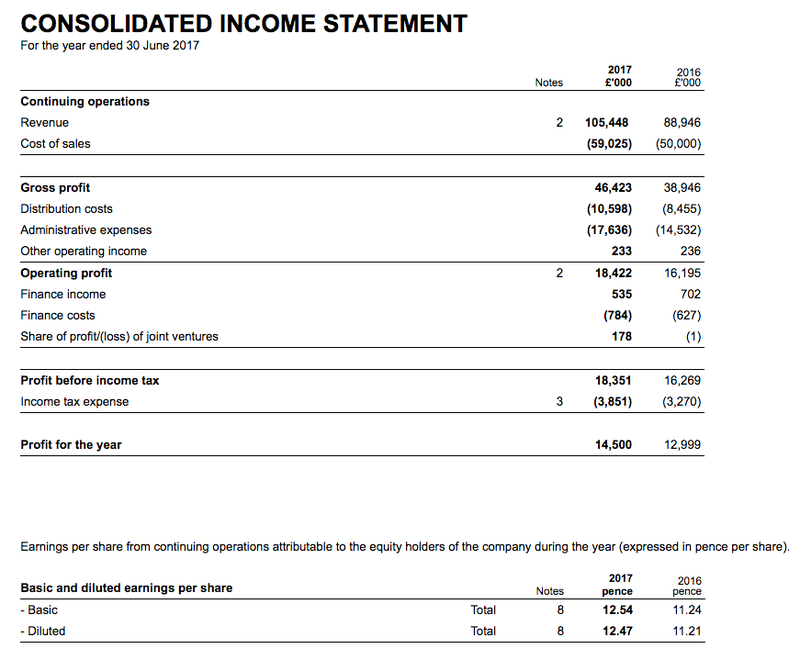 Reading TFW’s subsequent interim results made me realise that I did not study the firm’s 2017 annual report. I did wonder why some of the balance-sheet entries were odd. There was no real indication of why economic conditions may deteriorate, unless it relates to the new Brexit risk. Representing almost 7% of total revenue in its first year is not bad. 9% constant-currency growth versus 25% reported growth really ought to have been spotlighted prominently within the management narrative. However, the subsequent interim results suggested the issue is stiffer competition. ii) the former owners of Lightronics to fund their new 35% equity participation within the subsidiary. The subsequent interim results showed loans and receivables up £2m to £6m. I assume the Mackwell situation explains part of that increase. I have been told the land near the River Wye, which includes fishing rights (see point 7 below), is used for entertaining clients (and directors?). Years ago I heard TFW’s portfolio included Lloyds TSB. No, I am not sure why you’d bother with such a fund either. More notably, I see intangible write-offs and transfers came to £2,334k during the year. The transfer looks to be just £23k, so the £2m-plus write-off was significant. …shows amortisation of £2,302k, so I can only assume the write-off is taken directly as an expense to the income statement. For 2016, the write-off was £1.2m and for 2015 it was £0.8m. So the sums are becoming larger, which may indicate certain product developments are not going entirely to plan. Note also a £262k goodwill impairment — a small figure, but indicates something TFW has acquired has not worked out. Average trade receivables as a proportion of revenue was 17.6% for 2017, versus 20%-plus for the three previous years and the lowest percentage since 2009. 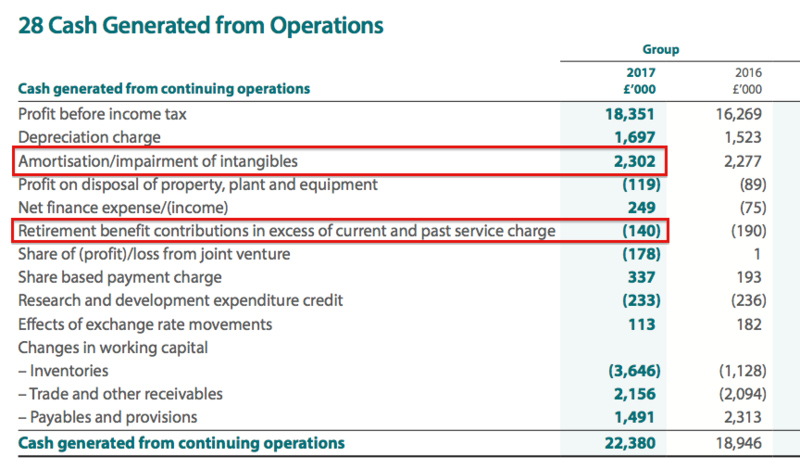 The subsequent interim results showed these ‘other payables’ advancing significantly to £11m… and I am not entirely sure why. There is another acquisition to consider, but I am not sure that explains everything. This is an entry I will need to keep an eye on. I am sure other companies — Getech being one — account for such credits in the tax calculation. Employee costs as a percentage of revenue — at 26.6% — was the lowest since at least 2004. Up until 2016, the figure had generally been 28%-plus. Revenue per employee also set a new record at £165k — 10% up on 2016 and double that achieved back in 2005. Average employee cost is now £44k, up 10% on 2016. 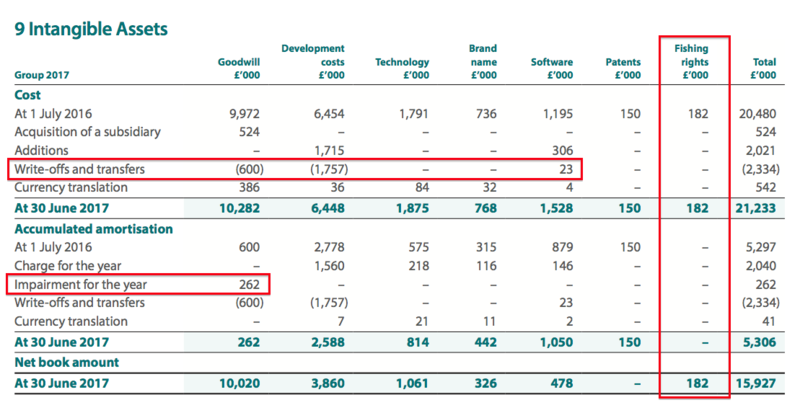 Basic wages for the top two increased by only a few 000, and do not appear extravagant for a business reporting an £18m operating profit. Bonuses do not appear outrageous either. Staff options represent less than 2% of the share count, and board options less than 1%.